Design Thinking has become one of the new trending buzz words in business, but what is it? We’ve noticed it gets thrown around a lot out of context and it’s not about a company focusing on pretty visuals. If you try to look it up, you’ll likely find various definitions and methods for it, so we thought we’d define what Design Thinking means to us. What you may be thinking is “Design Thinking as opposed to…what?” The answer is Systems Thinking, sometimes known as Analytical Thinking, and it is the more traditional mindset for problem solving. So now we can partially define Design Thinking as a mindset for problem solving. Let’s contrast Systems Thinking and Design Thinking. In Systems Thinking you break a problem down into component parts, systematically analyzing each part and how they interact. Then you solve each component problem one at a time, always focused on the problem at hand. Design Thinking, on the other hand, is focused on a solution instead of the problem. Instead of focusing on parts of the problem, Design Thinking challenges you to think about what a solution would look like for the whole problem while focusing on the people who the problem affects. Next, let’s try a literal definition of Design Thinking: to think like a designer. But what does that really mean? How do you think like a designer, especially if you’re not a designer? 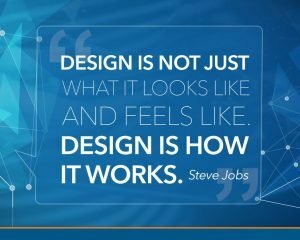 Steve Jobs is famously quoted as saying “Design is not just what it looks like and feels like. Design is how it works.” But that should even be taken a step further. Design is how it works for someone. A designer solves challenges through creativity, rapid iteration, and most importantly, empathy. Empathy is critical in design because learning and understanding how people use, interact with, and feel about a design is crucial to design success. Design cannot be done in a vacuum, and not considering the who in design is just setting yourself up for failure. In that way, the tenants that lead to other popular ideas like Agile Methodology, User Experience and Customer Experience are actually all applications of Design Thinking – taking a people-first approach to develop an application, design an app, or to create better customer experiences. Let’s illustrate these concepts with an example. Say you have a 100-piece puzzle that you want to put together with a young child full of excitement for accomplishing the feat of fitting all those pieces together. During the process of putting it together, you discover that there are 10 pieces missing. 10 pieces is a lot! That amount of missing puzzle is pretty hard to ignore, and that impassioned child is suddenly disappointed and upset that the end goal cannot be completed. How do we finish the puzzle and save the day for the child? A Systems Thinking approach might be to think about the last time the puzzle was put together, come up with a list of likely places the puzzle pieces may be located, and search each location until all those 10 pieces were found. If all 10 pieces are found then the problem is solved, but what if you still can’t find all 10 pieces, and what if child gets tired of looking? While that is a possible solution, and probably how most of us would try to solve the challenge, it is forgetting the child. Remember, the whole point was to keep that young child entertained. Is that child really going to wait patiently while you try to find the missing pieces? A Design Thinking approach, however, would first consider the people involved – being you and the young child. The ideal solution would be to have a finished puzzle. Searching takes time and probably won’t be entertaining. But who said you had to find the missing pieces? Why not just make some new puzzle pieces? The kid is intrigued by craft projects, so your Design Thinking solution is to create some puzzle pieces that fit those missing spaces. You gather some paperboard, and scissors and make new puzzle pieces. You get a set of markers and color in the pieces adding your own creative flare to the solution. In some cases, you don’t get the pieces to fit perfectly at first, but that’s OK, as you just quickly try again. Before you know it, you have 10 new puzzle pieces! They may not match the missing ones exactly, but you finish the puzzle, and you and the child had fun doing it. Most importantly, you satisfied the people involved and who directly benefited from the solution. As a side benefit, the child discovers that they like that activity a lot and wants to create more puzzles from scratch. The Design Thinking approach reframed the problem around who we were solving it for. The problem wasn’t just that the puzzle had missing pieces, the real problem was that the child was upset about not being able to finish the puzzle. The solution did not have to be finding the missing pieces, but it did need to be entertaining to a child who enjoys craft projects and result in a finished puzzle. The creative approach also organically resulted in a great unanticipated benefit, the child discovered a fun new hobby, creating homemade puzzles. So, what is Design Thinking? It is not a strict process and it does not get bogged down by over-analyzing a problem. 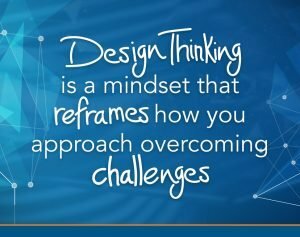 Design Thinking is a mindset that reframes how you approach overcoming challenges. It relies on empathy for the people effected by the challenge. It requires creativity and rapid iteration to develop a solution, and it often naturally leads to innovation and new opportunities. Consider applying this example to business challenges you may be facing today. Design Thinking can be applied to operational problems, sales strategy, and customer engagement; not just marketing. It can be extended to both the internal and external customer in business. Design Thinking applied to overcoming business challenges opens the aperture to solutions with purpose and intent to those you are trying to solve for, your customers. Design Thinking challenges a business to reframe every problem from a customer perspective and leads to solutions that create new opportunities and innovation. As markets become increasingly saturated and competition is higher than ever, it is critical for businesses to be innovative and to ensure that customers are having a great experience to not just gain an edge, but to remain competitive. Herein lies the power of Design Thinking and why it is becoming such a trending concept in businesses today. When you focus on developing creative solutions to holistically solve problems for people, rather than just tackling a business problem, the results naturally end up innovating and creating better experiences for customers. Try to solve a problem for one customer and then extrapolate that solution to 10, to thousands and to millions. You may just find all the missing pieces to many of your business challenges.